I have an advice for the desperadoes who are peddling falsehood on the internet. They should please leave me out of their devilish schemes and spend the last few years they have in Nigerian Army in a more constructive manner and prepare for the reality of civilian life, because whether they like it or not, everybody must leave the Nigerian Army at some point. And in civilian life, it is your abilities, talents, networking, providence and above all, favour from the Almighty God that counts for you and not worthless clichés and covers, like “I am a regular combatant”. After all, come to think of it, if they were as good as they want to claim that they are, they should seize the bull by the horns and go out there and slug it out like everybody else, instead of hiding their mediocrity under the banner of the Nigerian Army. 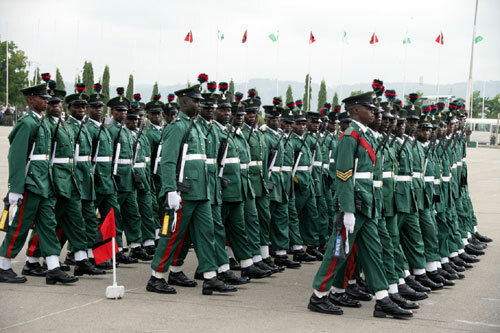 My attention has been drawn to a publication being circulated on the internet (for instance Daily Post Nigeria), claiming that there is some dissatisfaction within the ranks of the Nigerian Military regarding postings and promotions. In that report the authors purportedly included my name, as one of the Nigerian Army officers, who was “retired unlawfully” (sic) late last year. This so-called report is illogical falsehood at its worst. They may fool the uninformed, but please spread the word, so that others will not be fooled. My own case is a clear example, Sometime last year, I confided in a few friends and members of my family that I was going to voluntarily retire from the Nigerian Army, in order to take up an offer of a professional appointment with the United Nations, as a Judicial Affairs Officer. This is different from the position I was holding at the time, with the same United Nations, in the Congo, as a Military Prosecution Adviser, on secondment from the Nigerian Government, as a Government Provided Personnel (in the UN parlance, it is called “GPP”). In the UN system, seconded GPP positions, like the one I was holding in the Congo, are more like part time positions, because you only serve the UN for a limited period and then you go back to your government appointment in your home country. Then again, the conditions of service are different. The professional positions, like the one I am currently holding in Juba, South Sudan, are a lot more difficult to get and they obviously pay a lot better. The professional appointees in the UN system are to the UN system, what the Regular Combatant is to the Nigerian Army, if you want an apposite comparison. And so obviously, I was very, very, very happy to retire voluntarily from the Nigerian Army last year to start what I felt is a more professionally rewarding career, as an international civil servant. At no time was I unlawfully retired from the Nigerian Army. Infact, I had to seek the interview of the Chief of Army Staff, to crave his kind indulgence to hasten up the process of my voluntary retirement, because I was in danger of losing the offer of appointment made to me by the United Nations, due to the lapse in time occasioned by the long process of retirement from the Nigerian Army. The authors of that fake document circulating on the internet are therefore cowards of the worst type, not fit to wear the commissioned ranks they hold. The Nigerian Army I left last year may not be perfect, but at least for the first time in a very long time, I witnessed appointments being given to thorough professionals. More like “square pegs in square holes”. I remain eternally grateful to the Nigerian Army for having given me the opportunity to serve my country for 23 years, without blemish. During my period of service, the Nigerian Army gave me an opportunity to improve myself and acquire additional professional skills, which have proved extremely useful outside the Nigerian Military. The problem of the authors of that fabricated falsehood, is that they are victims of a mindset, which is partly their fault and partly that of the system, which indoctrinated them from an impressionable age, to believe that once you are a regular combatant officer in the Nigerian Army, from certain parts of Nigeria, (obviously excluding the Eastern part- read that to mean the East and South South parts of Nigeria), you have the key to the gates of paradise, to embezzle money and get rich through the Nigerian Army. Again, they are partly to blame because they have stuck to this mindset, which has as its hallmark, a misplaced sense of entitlement. Most of them have remained with the NDA certificate which they got when they passed out from NDA, over thirty years ago. They have not improved themselves professionally, by way of university degrees or other professional qualifications, which would have given them crucial dual purpose skills that would make them comfortable in an increasingly competitive job market outside the Nigerian Military. They are therefore a group of desperate men who have “put all their eggs in one basket”. And you know, the more desperate a man is the more thoughtless and dangerous he becomes. Their only claim to fame is the refrain, “I am a regular combatant…this job” and other such worthless clichés. Forgetting that times have changed. Since the military is no longer involved in civilian governance, they are fewer and fewer juicy positions within the Nigerian military for an increasing number of brilliant officers. So something must have to give eventually. People who feel entitled are going to be passed over for promotion. That is just the reality. I have an advice for the desperados who are peddling falsehood on the internet. They should please leave me out of their devilish schemes and spend the last few years they have in Nigerian Army in a more constructive manner and prepare for the reality of civilian life, because whether they like it or not, everybody must leave the Nigerian Army at some point. And in civilian life, it is your abilities, talents, networking, providence and above all, favour from the Almighty God that counts for you and not worthless clichés and covers, like “I am a regular combatant”. After all, come to think of it, if they were as good as they want to claim that they are, they should seize the bull by the horns and go out there and slug it out like everybody else, instead of hiding their mediocrity under the banner of the Nigerian Army. After all there is a larger space out there in civilian life for very hard working and smart people. If they are truly as clever and diligent as they claim they are, they should not have a problem shining in the wider world of civilian life. After all, as they say, “in the daylight, it is impossible to hide the sunlight”. Thank you my brothers and sisters. And if you can please give a voice to the voiceless, by helping to spread this message, as wide as possible. May God be with us all.